DC Direct has just released series 3 in their Secret Files collection. Four of Gotham City’s most infamous residents are included in this series. 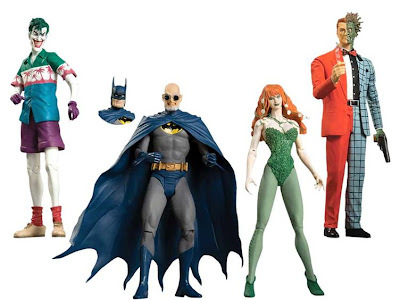 All inspired by the art of Brian Bolland, this Poison Ivy action figure is based on the cover of BATMAN: GOTHAM KNIGHTS #15, and the Two-Face figure is based on the cover of SECRET ORIGINS SPECIAL #1. Based on their appearances in the classic graphic novel BATMAN: THE KILLING JOKE, these versions of Batman and The Joker are now available for the first time ever as single figures. Hugo Strange (with alternate Batman head): Standing 6.75” tall, Hugo Strange features a convincing version of Batman’s classic blue and gray costume complete with yellow utility belt and molded plastic cape; the bat insignia is a black silhouette against a yellow background. The Joker: Standing 6.75”, the Joker features a multiple-color Hawaiian shirt, purple gloves and shorts, red socks and shoes; this is the deceptively frivolous look adopted by the Joker as he visited the Gordon residence and blatantly pummeled Barbara Gordon with a close-range barrage of bullets. Poison Ivy: Standing 6.5” tall, Poison Ivy is a rangy long-legged figure clad in a foliage one-piece with pale green stockings and dark green slippers; her neck is entwined in thin vines and her lengthy red hair is festooned with white petals; her sardonic expression is accentuated by her dark green lipstick. Two-Face: Standing 6.75” tall, Two-Face is clad in a bright orange/blue checkered suit that makes it impossible to decide exactly which half of the outfit is the uglier of the two; the scarred portion of Two-Face’s countenance is a viscid green mass with an enlarged eye, fringed by hackneyed spikes of hair. Two-Face is equipped with a pistol and his characteristic flipping coin. The cheapest I have found them online is from cornerstorecomics.com where each is $12.99 separately, or you can buy all 4 for $47.99.